Introduction: The Auditory Neuropathy is described recently as a hearing loss characterized by the preservation of outer hair cells and absence of auditory brainstem responses. Objective: To present a case report of hearing aid fitting in a patient with Auditory Neuropathy. Case Report: S.A.P., male, 32 years old, sought the Otorhinolaryngology Service after five years of Guillain-Barré syndrome, complaining of progressive and bilateral tinnitus auditory loss in both ears. The audiological evaluation resulted in: severe sensorioneural hearing deficiency with bilateral irregular configuration; speech recognition rate of 0% and speech detection rate in 35dB in both ears; type A tympanometric curve and absent ipsilateral, bilateral and contralateral reflexes; absence of waves and presence of cochlear microphonics in both ears in the auditory evoked potential and present bilateral distortion product-evoked otoacoustic emissions. The speech perception test was performed with polysyllabic words and lip reading, and presented 44% of hit with hearing aid and 12% without it. Final Comments: Despite the differences in the process of hearing aid habilitation and rehabilitation, we conclude that sound amplification brought benefits to the patient with auditory neuropathy. The term auditory neuropathy or neural dyssynchrony has been used generically to designate discrepancies between the cochlear and neural functions of the auditory system. So far we cannot yet determine precisely the existing diagnostic methods in the clinical praxis, the exact region of the auditory affection. Such difficulty to determine the exact location of the change along with the diversity found in the audiological and neurological findings between the cases has raised objection on the relevant procedure for auditory habilitation and rehabilitation of the patients with such alteration. As for its etiology, it's probably derived from several factors, such as metabolic toxic, linked to complications of hyperbilirubinemia, prematurity, anoxia, mitochondrial disorder, genetic immunes and alterations. Some studies describe the frequent association of the auditory neuropathy auditory symptoms with those of other neuropathies, such as hereditary neuropathy of type II Charcot-Marie-Tooth, Friedreich's ataxia, optical nerve neuropathies, Guillan Barré's neuropathy and the peripheral neuropathies secondary to uremia cases, diabetes, cisplatine exposure, kernicterus between changes like reflexes, motor and sensitive alterations, gait deviation, choreatic movements, presence of nystagmus and vertigo (2,3). According to Spinelli et al. (4) (2001), in the case of auditory neuropathy association with the peripheral neuropathies there are motor alterations and gait deviation, in addition to a reduction of the reflexes and tactile sensitivity, hearing loss and vocal discrimination change, which is generally the main complaint of these patients. As for the habilitation and rehabilitation of the patients with auditory neuropathy or neural dyssynchrony, there is also a great divergence in the literature researched, since this population behave very heterogeneously in the audiologic and neurologic assessments. The objective of this study is to report the results obtained from the hearing aid fitting in one case of auditory neuropathy after a Guillain-Barré's syndrome episode, so that it becomes more and more understood for the prompt and full rehabilitation of the patients, which ensures them a better quality. S.A.P., 32 years old, male, white cutaneous pigmentation, sought the Emergency Room of this Institution with a case of flu, fever, productive cough and epistaxis for 20 days without improvement. Upon neurologic clinical exam, he presented with hallucinations, cerebellar ataxia, reduction of the muscular strength, sensitivity and lower and upper limbs reflexes diminishment. We carried out cranial tomography, which showed ischemic lesion in the left cerebellar hemisphere. He was discharged after 13 days of internment with diagnosis of Guillain-Barré's Syndrome and was sent to the Otorhinolaryngology Service of the same Institution with a case of dysphonia and to the Physiotherapy Department due to feet and hands paresis and paresthesia. The patient sought the Otorhinolaryngology Service after 5 years from the syndrome's episode, complaining of hearing loss in both ears, of progressive nature and with bilateral tinnitus. Upon the Otorhinolaryngological exam, he presented bilaterally integral and clear tympanic membranes. In the mouth and nose exam no alterations were noted. 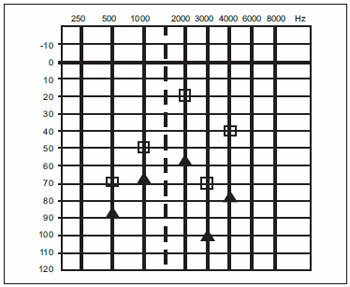 Threshold tonal audiometry: Severe level sensorioneural hearing loss and irregular configuration, according to ranking by Davis & Silverman of 1978 (5). Tympanometry: type A curve and ipsilateral and contralateral reflexes bilaterally absent. Evoked auditory potential of encephalic trunk: absence of waves I, III and V in 99 dB NHL and presence of cochlear microphonics in both ears. Distortion product-evoked otoacoustic emissions: only absent in the frequency of 5297 Hz in the right ear and absent in 469 Hz, 1359 Hz and 5297 Hz in the left ear. Considering the results described above we concluded that the patient had a compatible case with auditory neuropathy and was sent to the Phonoaudiology Department for test with the hearing aid. During the hearing aid selection, we carried out tonal audiometry in free field with functional gain research, in which the data may be viewed in Picture 2. And the Speech Perception Test with polysyllabic words with hearing aid and with lip reading due to the degree of understanding difficulty presented by the patient, which obtained 44% of hit. This test was carried out without hearing aid, and resulted in 12% of hit. Picture 1. Threshold tonal audiometry - moderate level sensorioneural hearing loss and bilateral irregular configuration. O - Thresholds obtained in the right ear, x - Thresholds obtained in the left ear. Picture 2. Free field audiometry with demonstration of functional gain - The square symbol presents the thresholds obtained with the use of hearing aid and the triangle without its use. Today the patient is familiarized with one pair of digital retroauricular hearing aid and states he uses it effectively without hearing discomfort complaints. He says he hears better with the hearing aid, but not with much understanding. In our study we confirmed a large correlation as to the Auditory Neuropathy etiology between our findings and those described in the literature, since the said patient presented a Guillan-Barré's syndrome episode after a virus case, and the sequels were motor alterations, hearing loss with signs of neural affection, alteration of the vocal discrimination and dysphonia. As for the hearing aid fitting process, a study was carried out with 30 patients with auditory neuropathy, 16 used hearing aid and didn't report an improvement of the social performance with its use (6). The same authors reported the hearing aids are intended for mimetizing the cochlea amplifying features, specifically as for the function of the external hair cells, and the fact there is no benefit with the use of such devices causes the examiner to suspect the sound amplification mechanisms may be integral (middle ear, external hair cells), and thus question the effectiveness of such rehabilitation strategy. According to Berlin et al. (7) (2001) the use of hearing aid must be indicated only in the cases where the EAOs are absent. Therefore, patients with primary NA must not be deemed to be susceptible to the use hearing aid. In a study carried out by Hood et al. (8) (2002), the author reported the patients with auditory neuropathy are able to distinguish some words or sentences in silence and present with many difficulties in situation where there is competitive noise. The same author also states the use of hearing aid may contribute to obtain a better detection of sounds, and a better discrimination necessarily occurs. In our study we confirmed that the patient had a significant improvement of the hearing ability both in the speech perception test in silence and the free field audiometry evaluation, with research of the functional gain, which shows the difference of thresholds obtained with the use of hearing aid and without it. It's also important to remark the patient uses hearing aids effectively without complaints of hearing discomfort. In the last decades, critical scientific studies have been developed and even today divergences as for the procedure to be adopted remain. In a research carried out with 32 children with auditory neuropathy, out of whom 15 were hearing aid users and 13 cochlear implant users, the authors didn't find significant differences between both groups evaluated (9). The accomplishment of cochlear implant has been a treatment option for the cases of auditory neuropathy, some studies made with patients implanted didn't find satisfactory results for the population studied (10,11). However, other studies show a great benefit of the cochlear implant in children with auditory neuropathy, and it achieves an open field vocal discrimination of 70% (12). The cochlear implant has been an option for the habilitation and rehabilitation process of the patients with auditory neuropathies who were not benefited from the hearing aid and present a threshold tonal audiometry of severe to profound degree. The hearing aid fitting presented a significant benefit to the patient with auditory neuropathy. Even with controversies in the literature on etiology, audiologic results, hearing aid habilitation and rehabilitation in the cases of Auditory Neuropathy, we believe all the efforts must be considered and taken for the users. 1. Specialist in Audiology. Phonoaudiologist of the Otorhinolaryngology Discipline Service of the Medicine College of Marília - FAMEMA. 3. Doctor's Degree in Otorhinolaryngology Head of the Otorhinolaryngology Discipline of the Medicine College of Marília - FAMEMA. 4. Specialist Doctor in Radiotherapy. Professor of the Oncology and Radiotherapy Discipline of the Medicine College of Marília - FAMEMA. Institution: Faculdade de Medicina de Marília. Marília / SP - Brazil. Article received on April 28, 2008. Approved on November 23, 2008.